Jungle Red Writers: The Good Ones! Release Day for Jenn! JENN McKINLAY: It's always so exciting when a new book is released! The Good Ones launches a brand new romantic comedy series for me, which is set (oh, my heart) in a romance bookstore tucked away in the mountains of North Carolina. I've always wanted to own a bookstore - more in theory than reality - so this was perfect for me. It has everything I love in it, books, kittens, books, cowboys, books, comedy, books...well, you get the idea. I've been very fortunate to garner some amazing reviews and even a starred review from Booklist for which I am very grateful. And now, just because I can, I thought I'd share an excerpt with you, because it's my book birthday and why the heck not? They weren’t going away.Maisy rose from where she’d been seated on the bottom step of the stairs. In theory, she was supposed to be cleaning out her Great Aunt Eloise’s house, in reality she was binge reading Auntie El’s hoarder’s trove of romance novels. It wasn’t making the task, which was heartbreaking to begin with, any easier. JENN: I have to say that one of the best parts about writing this series has been being able to share all of the authors and books in the romance game - yes, starting with Jane Austen - that I have loved over the years. So, Reds and Readers, have you ever wanted to own a bookstore? If so, what type? Happy Book Birthday, Jenn! Thanks for sharing a bit of your story with us . . . I can’t wait to read the rest. Oh, any kind of a bookshop would be perfect, wouldn’t it? Having a bookshop is an absolutely perfect idea. Of course, the reality is that you’d have to be really business-oriented, and I’m not at all sure that that’s me. But still, it’s a really nice idea to dream about . . . . Thank you, Joan! Yeah, it’s definitely more fantasy than reality for me! Happy book birthday, Jenn! And thanks for the laugh out loud teaser, too! I love your sense of humor. I've never consciously wanted to own a bookstore. But it occurs to me that if I slapped some price tags around this joint I already have enough stock for a dandy one specializing in previously read books! LOL, Karen! The Hub is a book hoarder - I’m thinking he could or a thriller/noir/rock bio store of his own. I would love to own a mystery bookstore. And, considering that we now have none in Los Angeles (city or county), there should be a market for it, right? Of course, I was thinking a little outside the box and having books and mystery movies and TV shows. Something tells me it wouldn't be all reading, however, so I bet the dream would be greater than the reality. This is awesome, Jenn. I love Perry! I've never owned nor dreamed of owning a bookstore, but sure have spent a lot of time in them. All the best with the new book. They are like second homes! No doubt! Thanks, Edith! I don't know that I've ever wanted to own a bookstore. That's an awful lot of work I'd be taking on. However, I do wish that I had an honest to goodness mystery bookstore near me that I could frequent enough that I'd be a well known customer. It is the best. I’ve lived down the street from the Poisoned Pen for twenty years - when I think of moving, the Pen is one of the reasons I hesitate! Oh, to own a bookstore! I know the hard work it would be, yet it would be worth it! I still wish I could have the chance. It would be in a small town, preferably on the coast. It would have new and used books. There would be a room to hold small meetings in, such as book clubs, knit and knatters, etc. There would be two front windows that would be decorated for the seasons and big comfy chairs throughout. I have given this some thought! I hope I can read your new book soon! I would be a frequent visitor to such a bookstore, Deb. Sounds wonderful. Oh, Deb, I would love that! Sounds perfect! I've worked retail, and as the walls closed in, I yearned to be alone, away from the constantly ringing phone and demanding customers for other departments (what do you mean you can't sell me a lamp?) The bookstore part is appealing. Ugh, retail is brutal. I’m sure it is for booksellers, too, but...books! Thanks for the excerpt from the new book. It sounds intriguing. Can't wait to read! I've wanted to own a bookstore/tea shop since first reading Carolyn Hart's Death on Demand series. But like you Jenn, I think in theory more than reality. Perhaps if I could run around solving mysteries with a dashing partner like Max Darling, while popping into the bookstore now and then to see how my employee is faring, it would work better! I love Carolyn’s series! Side note: she is one of the nicest people I have ever met. I simply adore her. Thanks, Lucy! I love the way you think! This is so instantly endearing! Engaging and charming and intelligent. You are such a huge talent! ( and I love when you say trust me! I am imagining her handing him that book :-) :-) :-) — that’s what you meant, right? Oh,… No? ) Love this! And congratulations. Of course, I did! And thanks for the kind words - you’re lovely! We have NO bookstores nearby except a BAM. The next town over (Milan, Ohio) has a quaint town square and a building came empty on the west side of the square. Perfect location for a bookstore--close to major cities and easy access. And I thought of some great marketing ploys. However, I also know how hard it is to make a bookstore successful. Probably be easier if all the books were as well-written as yours, Jenn! Congratulations!! What a lovely thing to say, Flora! Thank you. I realize how lucky I am to have a bookstore in the neighborhood - I’d be lost without it! Jenn, that is a FABULOUS opening! No wonder Booklist starred you. "Brilliant conceived"!! Wahoo! As someone who lives with a book collector, owning a bookstore is NOT my idea of heaven. Nope nope nope. Quite the opposite. I do love bookstores, though these days to survive these days at least half of their space is devoted to toys and gifts. SMART toys and gifts. I can't walk out without buying something. Thanks, Hallie! You’re lovely! My Hub is a book hoarder - so I hear you! Yes, I’ve noticed the local BN has all the science stuff happening - very cool! Congratulations, Jenn! I've been looking forward to this one! In my fantasy life I have considered owning a book shop, but I'd be my own best customer! I've also considered a yarn shop, ditto! Yarn/book stores and I’d never leave, Judi! That would be the shop for me as well, Judi. But strictly as a customer. One who was in almost daily. Could I get a discount if I taught other customers how to knit socks? so good to read this congrats jenn! keep up the good work. Our favorite independent bookstore is across the border in Niagara-by-the-Lake, Ontario. Lord only knows how it continues to exist. It's tiny, one long narrow room in an old house, and there are fewer than half a dozen copies of any book, if that many. The proprietor is a lady of a certain age, one who dressed and had her hair done in 1957 and has seen no reason to change a thing since then. Asking her to find a particular book takes courage, and god help you if it is one that she disapproves of. We call her Miss Formidable, a tidy version of Miss Haversham. Kudos on getting to your publication date and happy Chinese New Year, an auspicious day for launching the new book. Thank you, Ann! Miss Formidable sounds like an excellent character for a book! Oh, Chinese New Year! You’re right - perfect day for a book launch! Jenn, you had me at bookstore and Maisy (Maisie was the name of a character in books I read in childhood). There was once a wonderful independent bookstore in Atlanta where I would spend hours and hours. They were among the first to have a café, The Cup and Chaucer. They also sold used books and well, I would stock up. Now all there is are B & N's near me. So I go to the library. Seriously, I am looking forward to this series. It has all the things I love. Thank you! The Cup and Chaucer - genius!!! Welcome to the reading world "The Good Ones" may you never go out of print. My fantasy involves winning the 672 million powerball. After the taxes and lawyers go away, I buy a book store, stock it and then give the books to whoever really needs/wants one. Congratulations on your new book Jenn. I love the excerpt of The Good Ones . It's like I was there to witness the scene. Happy Book Birthday, Jenn. Thanks for sharing the excerpt. I'm hooked! I think the idea of turning an old Victorian into a bookstore is perfection. There are so many bookstores in literature and each one offered something I would love to have in my own fantasy bookstore. However, for a more hands-on experience, I've read about this listing on AirBnB for a small village in the UK. On the street level is a bookstore and the living quarters are upstairs(?) I believe. You run the bookstore for the length of your stay. You are free to move things around, design the front window display, the interior displays, all of it. You can set the hours the store is open so you can do your sightseeing etc. You wait on customers and make recommendations. The listing didn't promise a hunky builder from town would drop in, but you never know! I saw a Christmas movie this past season about such a bookstore, set in an old house in a small town in Vermont. Not as predictable as a Hallmark movie, thank goodness, and the house was wonderful! Congratulations on your book birthday, Jenn! I worked in a bookstore back in the day, between college and seminary. I loved almost everything about it - the books, of course, helping customers, etc, but the store itself had no charm - brand new store in a small strip of stores. I love the kind where you can go in and browse, have some coffee/tea and sit and read all day if you want, or a good conversation with someone. LOL, that would be a stellar bonus! Happy book birthday, Jenn. Any book that starts with a Jane Austen discussion is for me! But confession... I've never wanted to own a store of any kind. I worked at a delicatessen while I was in college. Such hard work and so many people are rude and grumpy! But I love hanging out in bookstores. Me, too. I actually write at the local BN sometimes - it looks out over some fountains that are lovely. That's what we really need - writer's dens - but in a public space so you can people watch while you think! Jenn, I'm squeeing with pleasure at that excerpt - I want to read the rest of the book RIGHT NOW! Thanks, Julia! You're delightful enthusiasm soothes my release day nerves! Happy Book Birthday, Jenn! 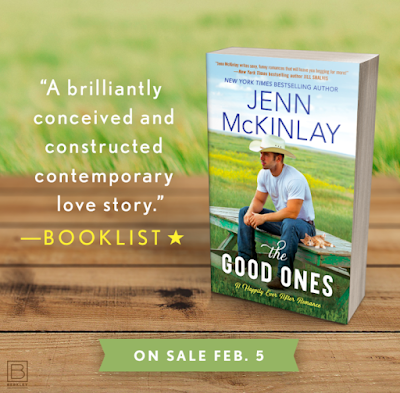 The Good Ones is waiting on my Kindle. It will be my reward for getting through today's to-do list. Own a bookstore? Probably more work than I'm willing to do at this point in life but I sure wish someone would turn one of the empty storefronts in my town into one. Loved the opening, Jenn. I want more! I love bookstores but I have no desire to run one. My fantasy is to have my own lending library if I ever live in a much less populated place. It would be set up in a room with its own outside entrance or in a fixed up shed. It would run on the honor system. Readers would record what books they’re borrowing. People could sit and visit or read. And I would not have to be present unless I feel like it. Happy Book Birthday, Jenn! The Good Ones sounds like a great read. Books, bookstores, old house, and a cowboy are the ingredients for a yummy dish indeed. And, we all sorely need a feel-good read in what is a dreary winter here. I've always had a fantasy of owning and operating a bookstore, but I don't have a complete vision of what it would be. I lean towards a cozy, inviting atmosphere in an older building or house, something where maybe the architecture and history of the place is interesting. As my interests are mainly mystery and crime, it would be great to have a focus on that. However, there are other fiction books and non-fiction books that aren't necessarily related to mystery that I'd like to offer, too. And, since I love to nurture young readers, I'd have to have a section for children and young adults, too. My wildest dream is to have a bookstore where my whole family could be involved, with my daughter and son working there, too, but, of course, it would have to be quite successful to accommodate good salaries for all. So, maybe a small bookstore on the main street of a small town would be more ideal for me. Whatever it would be, there would be cozy seating and maybe a small coffee bar. A bookstore dynasty, Kathy? I love it! The Reds will come and sign there for sure! Jenn, Happy book Day.....I just celebrated with you by ordering it on Amazon! Due to arrive on Thursday, can't wait to read it. Thank you, Helen, you're lovely! Yay, Jenn! You are an example to us all with your amazing books and your equally enviable breakfasts! Happy, happy pub day! Thank you, Ingrid!!! Delightful to see your smiling face. We miss you!!! Chiming in late, but congratulations on the new book, Jenn! I can't wait to read it! I can't say that I've ever wanted to run a bookstore, but I have had fantasies of living in one. There was a B. Dalton bookstore (anyone old enough to remember those?) that shared the same parking lot with my favorite pizza joint and the retail store where I got my first out-of-college job. Getting even a part of my paycheck out of that parking lot was a challenge every week. Waldens and B.Dalton in the good old mall trolling days. Gosh I miss the 80's/90's! Shalom Reds and fans. I live in Doylestown, PA (Bucks County). In a half mile radius from the center of town, we have 4 bookstores and a well appointed public library. We have a large independent bookstore. We have two used bookstores which living amicably side by side in the same old building. We have a children's bookstore which has moved more than several times in the last 25 years but continues to sell everything from picture books to YA titles. I have been in and purchased books at each of these. However, I must admit, I have been lured away more often than not by Amazon and public library ebooks and e-audiobooks services. However, what we really need is an internet cafe. The library has computers but you can't be really creative without some huhbub around and they frown on coffee. We have three Starbucks and several independent coffee shops with free wifi in town and lots of folks just park themselves with their laptops there. Using public wifi has become more than treacherous. So we would have to provide really good internet security. And yes, there would be lots of books to borrow or buy, with large sections devoted to mystery and IT. Perhaps, even a few chess and checker boards. And if we didn't make any money, well.. money isn't everything. David, I do believe I have bookstore envy - and I live near the hallowed Poisoned Pen! I love Internet cafes - especially in Europe when I refuse to bring my laptop. Jenn, happy book birthday! Look forward to reading the Good Ones! My idea of a bookstore would be that bookstore in Scotland. You get to rent a flat and "own" a bookstore for a week. That sounds like fun! Which books would I stock? I would sell "hard to find" books that you cannot find anywhere except at mystery conferences or book conferences or online. I love that I am able to find your books at bookstores. I would stock children's books too. I would have my favorite authors' books. I like many genres, including classical mystery. I would set up an area where children can sit and read. And some chairs for adults too. I love bookstores. My favorite bookstore is in the hills. it is called Great Good Place for Books and they have an area for children and teenagers to sit and read. Sometimes they serve cookies. Own a bookstore? I'd have to talk to people - face to face! Scary, scary. If I could stay in the back, over looking the creek, it's by the creek, and order the books that would be great. Of course being in one of those really pretty old houses would be great but those are usually are in nice residential neighborhoods, not where people go shopping. But it is by the creek. It would have a place to sit down, maybe enjoy some nice beverages. It would have a place for speakers that had comfortable chairs to sit in, I hate folding chairs. And it would have a variety of books because I want everyone to be able to come and enjoy it, from the little little ones who get to touch books, to the very elderly, who will need assistance from the very little ones and then everyone will be happy. And it would have to have a great section for yarn and crochet and because I crochet as well as read. And easy access to free parking. And possibly local delivery for homebound clients that like books to hold on to. And.... Oh, see what you've started... I'm out of control ... (wink, wink, smile, smile) Can't wait to read your new book.